Previously the size of this 'standard ruler' has only been predicted from theoretical models that rely on general relativity to explain gravity at large scales. The new study is the first to measure it using observed data. A standard ruler is an object which consistently has the same physical size so that a comparison of its actual size to its size in the sky will provide a measurement of its distance to earth. "Our research suggests that current methods for measuring distance in the Universe are more complicated than they need to be," said Professor Alan Heavens from the Department of Physics, Imperial College London who led the study. "Traditionally in cosmology, general relativity plays a central role in most models and interpretations. We have demonstrated that current data are powerful enough to measure the geometry and expansion history of the Universe without relying on calculations relating to general relativity. "We hope this more data-driven approach, combined with an ever increasing wealth of observational data, could provide more precise measurements that will be useful for future projects that are planning to answer major questions around the acceleration of the Universe and dark energy." Einstein's theory of general relativity replaced Newton's law to become the accepted explanation of how gravity behaves at large scales. Many important astrophysics models are based on general relativity, including those dealing with the expansion of the Universe and black holes. However some unresolved issues surround general relativity. These include its lack of reconciliation with the laws of quantum physics and the need for it to be extrapolated many orders of magnitude in scales in order to apply it in cosmological settings. No other physics law have been extrapolated that much without needing any adjustment, so its assumptions are still open to question. Co-author of the study, Professor Raul Jimenez from the University of Barcelona said: "The uncertainties around general relativity have motivated us to develop methods to derive more direct measurements of the cosmos, rather than relying so heavily on inferences from models. For our study we only made some minimal theoretical assumptions such as the symmetry of the Universe and a smooth expansion history." Co-author Professor Licia Verde from the University of Barcelona added: "There is a big difference between measuring distance and inferring its value indirectly. Usually in cosmology we can only do the latter and this is one of these rare and precious cases where we can directly measure distance. Most statements in cosmology assume general relativity works and does so on extremely large scales, which means we are often extrapolating figures out of our comfort zone. So it is reassuring to discover that we can make strong and important statements without depending on general relativity and which match previous statements. It gives one confidence that the observations we have of the Universe, as strange and puzzling as they might be, are realistic and sound!" The research used current data from astronomical surveys on the brightness of exploding stars (supernovae) and on the regular pattern in the clustering of matter (baryonic acoustic oscillations) to measure the size of this 'standard ruler'. The matter that created this standard ruler formed about 400,000 years after the Big Bang. This period was a time when the physics of the Universe was still relatively simple so the researchers did not need to consider more 'exotic' concepts such as dark energy in their measurements. "In this study we have used measurements that are very clean," Professor Heavens explained, "And the theory that we do apply comes from a time relatively soon after the Big Bang when the physics was also clean. This means we have what we believe to be a precise method of measurement based on observations of the cosmos. Astrophysics is an incredibly active but changeable field and the support for the different models is liable to change. Even when models are abandoned, measurements of the cosmos will survive. 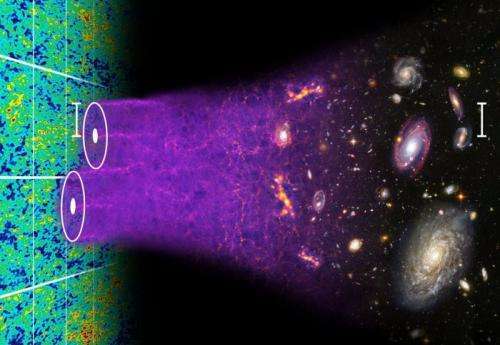 If we can rely on direct measurements based on real observations rather than theoretical models then this is good news for cosmology and astrophysics." Real data has to be "plugged in" into some theoretical model. Unless you are listing data as in the old Handbook of Chemistry and Physics. Who said that the universe is expanding or has a beginning? It was NEVER actually measured. Even Hubble questioned his skimpy data but was overruled by the religious drive of "father" Lamaitre et al. Check the Trouble of Physics by Lee Smolin and the new book by Alexander Unzicker-The Higgs Fake. So it is reassuring to discover that we can make strong and important statements without depending on general relativity and which match previous statements. Equally reassuring, if not terribly surprising, to see general relativity pass yet another test, and a good test it is calibrating the new BAO standard ruler using the standard candles. Careful, Stinger, or you will attract the ire of the establishment stooges like Cap Stumpydick and Aunty Ira. ?? can some explain what this means ? In physics there are extremely small scales, as with subatomic particles, and extremely large scales, as with the cosmos. Use google to "define extrapolate" if you need. "order of magnitude" – usually powers of 10, e.g., an increase from 10 to 1000 is 2 orders of magnitude (10^1 to 10^3), an increase from 1000 to a million is 3 orders of magnitude (10^3 to 10^6). Doesn't have to be 10, could be a variable, x, in an equation – an increase from x-squared to x-cubed is 1 order of magnitude (x² to x³). Most statements in cosmology assume general relativity works and does so on extremely large scales, which means we are often extrapolating figures out of our comfort zone. ^^^ fixed that for you – a better friend would be more like, "yo, wispy, it's a science forum, stop embarrassing yourself—the article—please READ before criticize!" Wrong, the steady state model of the universe was abandoned 100 years ago. Light is a wave, as a wave it is subject to Doppler effects. So if things aren't moving away from us why are far away objects "redder"? If they aren't moving away, that means the entire universe is heating up all the time, thats a blatant violation of the laws of thermodynamics which violates preatty much every law of nature in turn. The big bang makes perfect sense. One law of nature is that the entropy of a system is always increasing, if the universe is constantly moving towards a more chaotic state, doesn't that imply a time when everything was perfectly ordered? If everything is perfectly ordered how can space exist because space only increases the chances of disorder. So that the formation of Universe from "nothing" doesn't violate the thermodynamics and Steady state Universe model yes? In Steady state Universe the Universe just doesn't heats up - it doesn't change at all. So universe is a perpetuum mobile? What a violation of thermodynamics. Universe was not formed from "nothing". It was likely formed from some physical system where formation of an universe is thermodynamically preferred. Exactly what that thing was is unclear. The expansion of the universe, black holes and invisible phenomena that modern astrophysics with philosophical approaches try to explain reality in which we live is only for consumption of the general public, much of which does not have the basic knowledge to be able to be doubted in this pseudo science. Frankly speaking, I can not find a scientific reason for the adoption of GR theory in academia and society. There is no solid evidence for it which can withstand a thorough scientific analysis and the results of computer simulations relying upon it differ significantly with observed reality. Therefore scienties add virtual mass in these simalation models. I am not disagreeing with you, but wish to point out that there are other equally valid explanations for redshift, e.g. photons decay (expand) over time so that redshift is dependent on the age of the light not the movement of its source away from us, for one. Frankly speaking, I can not find a scientific reason for the adoption of GR theory in academia and society. There is no solid evidence for it which can withstand a thorough scientific analysis and the results of computer simulations relying upon it differ significantly with observed reality. GR (& SR) are constantly proven by frequent correction factors to GPS timing. Why viko_mx, do you IGNORE Global Positioning Satellites (GPS) ? You have been told this before yet are mute/dumb on any reply ? Did your god tell you space has no GR or Special Relativity (SR) Properties ? How do u explain GPS will NOT work without SR & GR ? The maths application to GPS via SR & GR is consistent with relativity & not only Einstein but Lorentz, why viko_mx, do U ignore it ? Did the shadow of a bible (of a nasty god that can't communicate) make your sight to physics so blind ? You can now buy atomic clocks very cheaply & prove it for yourself ! I have proven that Einstein's theory of relativity is not relevant. It was the mistake of the century, produced by the misinterpretation of Minkowski with the acceptance of Einstein. Since GR (& SR) calculations fit very well with GPS then what do u claim is wrong ? Where swordsman, is your "proof" Einstein's Relativity is "not relevant" ? Real measurements, according to the laws of physics and electromagnetism lead to correct answers and excellent correlations. GPS makes REAL measurements, do u need to study GPS perhaps, U know how to do that via google ? The basic problem is that physicists of more than a century ago knew more about electromagnetic radiation (upon which relativity theory depends) that today's physicists. Evidence for this (also outrageous) claim ? Who knew how & when, and how was this knowledge replaced & by what ? Details matter swordsman please ? ..there are other equally valid explanations for redshift, e.g. photons decay (expand) over time so that redshift is dependent on the age of the light not the movement of its source away from us, for one. There are differential methods which show this not to be the case, and allow for issues re gravitational lensing, not that I understand the details but, from my early physics training at uni, the consistency of the explanations do appear sound and that is the universe is expanding and the rate is accelerating. This doesnt mean there are not local gravitational anomalies & local collisions, eg Andromeda & our Milky Way galaxy will collide, we are part of a local group & vast but, that doesnt mean the whole universe is not expanding just because we observe seeming local non-expansion. Using COBE data (and other experiments) a lower limit of around 3 years on the photon rest-frame lifetime has been found—this equates with a lifetime of about 10^18 (that's a billion billion) years in the visible spectrum. See this Letter from Heeck, "How Stable is the Photon?" (Max-Planck-Institut für Kernphysik) and also this article on it, "Big Bang light reveals minimum lifetime of photons" (nature.com). If by 'expand' you mean "redshift" this is quite well understood and can happen for a variety of reasons—all supported by an abundance of different experiments and measurements. Ah. Well, keep in mind that when we look out into space we're also seeing things as they were some time ago (depending on how far away they are) so it's not like we can go there & then, and as Prof. Verde stated, "There is a big difference between measuring a value directly and inferring its value indirectly." Using baryon acoustic oscillation and supernovae to measure the distance has shown independently of general relativity, that general relativity is indeed applicable at cosmological scales, and that there's more than one way to accurately measure cosmological distances. If space is expanding relativistically, in order to explain why we appear at the center of this expansion, why doesn't the speed of light increase proportionally, in order to remain Constant???? It was one of the original patches, to match theory with observation, but they completely overlooked the fact that if those distant galaxies are actually moving away, such that it will take light longer to cross this distance, that assumes a stable dimension of space, as defined by the speed of light. Some try to argue light is just being carried along by this expansion and is only measured locally, but the basis of the proof for this expansion is the redshift of that very light crossing intergalactic space. So we are supposed to believe space expands, based on the redshift of this light, but have a stable dimension of space against which to compare it, based on the speed of the same light!!? Go figure. The life-time of photons is given with their decoherence time, it is in range of few milliseconds and after then the photon is recreated somewhere else, which brings the impression, it's literally eternal. Is that the Zephyr interpretation of quantum mechanics? Are you referring to microwave photons trapped with Rydberg atoms? Quite a difference from the spacetime for the CMB. if that's true then the measured redshift by an observer, O, of a light source in motion from point A to point B should be less than measuring the redshift of a source stationary at point B, because in the latter case all the photons propagate through a greater volume of vacuum, but we know no such result has ever been measured, don't we, iZeph? No, it does not predict perfect order. It's a relative state. Cap Stumpydick and Aunty Ira. so PhineasFogg is delirious_neuron! huh! would you please link the studies that support this conjecture? (sounds like tired light) thanks groupie #2! So how would you suggest either be based in actuality rather than argued in theoretical models? Take out a tape measure? Go back and watch? The Doppler effect works by having a moving source in a stable medium, yet when it was discovered that all these distant galaxies appear to be moving directly away from us, as though we are at the center of this expansion, it was then argued that this was actually a relativistic expansion of space itself and so every point appears as the center. Yet what was overlooked is that in order to be relative, the speed of light would have to increase proportional to the expanding space, in order to remain constant! But then there would be no doppler effect, since the light wouldn't shift. which you demonstrate so much, that you're actually serving as a living evidence of religious traits of modern science for us. so... my requirement of you and others to back up their conjecture with evidence supporting their speculations is proof of religion in science? i would say that it is proof that science works! so, if me requiring EVIDENCE of your conjecture is somehow religion, WTF do you call ren82's and jvk's creationist crap? so you are against ALL mainstream science because it has evidence... what else is new? where is your evidence refuting it? why argue a point if you can't bring EVIDENCE? Medium was probably not the best term. I suppose frame would work. Doppler works by movement in a larger frame. There is the denominator of the frame and the doppler effect is due to each wave having to travel a different length to the stationary observer, from the moving transmitter. This changing distance amounts to the numerator. The train moving down the tracks isn't stretching the space, as the tracks don't stretch, only the distance in this stable frame is increasing. Similarly the cosmic yardstick is the speed of light and if those galaxies are redshifted because of doppler effect, the theory is still assuming stable units, as measured by the speed of light. Thus it will take light longer to cross this distance as the galaxies move away and so the light waves become redshifted because they are stretched. That's why they say those distant galaxies will eventually disappear. As for religion, if you go back to the ancients, say the Egyptians, science/math and religion started as opposite sides of the same coin, as description and explanation of cosmic order. Say astronomy and astrology. The problem was that explanation is top down authority and description is bottom up examination. That their vitalistic religious explanations are problematic is due to our sterile view of nature, compared to their organic views. Consider epicycles; The mathematical description was highly accurate, because it was based on observation, but the explanation, of giant cosmic gearwheels, was based on the mechanical mechanisms that were high tech back in the day. Similarly I think we will eventually find the current belief in the mathematically platonic foundations of reality, such as spacetime, will prove to be erroneous explanations of the mathematical descriptions of relativity. By abstract reductionism, you end up with the skeleton, not the seed, but thats another post. Re maximal entropy of the universe, it, like remaining thermodynamics isn't well defined for the observable universe. But entropy is, and no it increases as it should. For a good analysis, see Lineweaver and Egan on this. @wasp: Read the article, it is good. As opposed to your references, which are bad: Smolin is fringe, and the title implies Unzicker is a nut (but I have never heard of him - is he a scientist even?). GR is reconciled with quantum physics on these scales (outside of big bang or black holes), and thermodynamics is also extrapolated to these scales, shy of the scale of the observable universe. - Re cosmological doppler shift: There is a part of it that has to account for the expansion during travel of course, But the primary effect is the stretching of the photon's wavelength as it travels through a stretching space. See Wikipedia's entry on this. - Re science, you are confusing it with the religious claim that "natural science" was the same as productive science. The latter emerged during the Enlightenment, when secular activities could free themselves from religious oppression and control. So, you say "There are differential methods which show this not to be the case". Perhaps you could provide a link for them? What does this mean? Try writing in English. Given that redshift might be a combination of Doppler effect, photon decay by age, and perhaps other factors, a sample from known readings adjusted by the removal of the top and bottom percentiles (as being non-representative e.g blueshifted for example) leaves a pretty convincing argument that redshift correlates with photon age. Who the f*** is delirious_neuron? http://arxiv.org/...94v1.pdf]http://arxiv.org/...94v1.pdf[/url] is irrelevant to this discussion. No it doesn't, the effect could equally by ascribed to time itself passing more slowly in the distant past, and several other reasons. The premise of relativity is that since nothing can travel faster than light, there are no atomic oscillations at the speed of light, because that would combine with velocity to exceed the speed of light. So as velocity decreases, the rate of oscillation can increase proportionally, so clock rate increases relative to how slow you go. Thus the speed of light remains constant, because the clock used slows as you speed up, until you reach lightspeed and there is "no time," because the clock is stopped. Now since gravity is "equivalent" to acceleration, a strong gravity field is both pulling everything together and slowing the clock rate proportionally. So time presumably slows down, as you fall into the black hole, as does the space shrink, so the speed of light remains constant to the space. It's a bit of a tautology actually, but the assumption is the math abstracted from this is somehow foundational to the physical processes from which it was abstracted. Therefore these measures of duration and distance are more foundational than the space and actions being measured. So when they discovered that we appear as the center of this expansion, it was an Ah Ha moment and they decided that space itself must be expanding. What they forget, is that if it's to be based on that relativistic math, then the speed of light would have to increase, in order for the clock rate to remain proportional to the distance. The whole CONSTANT thingy, remember? But if that were to actually happen, there would be no redshift, because the light would be "energized!!" As it is, the Doppler effect requires a stable measure against which to compare the expansion. So the wave length is stretched as it travels through this expanding space; You still have to have a stable dimension of space to compare it. What defines this measure? The universal constant is the speed of light in a vacuum, remember? So you are going to say the vacuum itself is being stretched? Then why doesn't the speed of light increase, in order to remain constant to this vacuum??? Are you saying there are two vacuums? The one which the speed of light remains constant and the one which expands, based on the redshift of that very same intergalactic light? I'm sorry if I seem confused, but this is the sort of math that would get an accountant in serious legal trouble. Gravity is treated as "equivalent" to acceleration, but the surface of the planet doesn't seem to be rushing out, on order to keep us stuck to it. Could there be some effect causing redshift that is "equivalent" to recession, without having those distant galaxies actually rushing away? The reason gravity is treated as a contraction of space is because space is treated as a measurement and mass points draw together. Now the contraction of gravity and the expansion of space are inversely proportional, resulting in overall flat space. "Omega=1." So mathematically, what is expanding between galaxies, is balanced by what is drawing into them and according to my understanding of how math normally works, this would mean there would be no excess expansion. Physically what is happening is mass falls into gravitational vortices and energy radiates out. If these effects are balanced, the result would be a cosmic convection cycle, which describes planetary and stellar activity, so why not galactic activity? Then the inward curvature of mass/gravity is balanced by an outward curvature of intergalactic radiation and Einstein's cosmological constant would be resolved. "the images of distant galaxies should appear smaller (and much less luminous), than we observing by now. Instead of it, they do appear larger and more luminous"
isnt there reputable science supporting your assertions? I have proven that Einstein's theory of relativity is not relevant. You must be a smart guy then, feel free to enlighten us. You seem to be suffering from the paranoid delusion that everyone who says something you do not like are actually the same person using different names. You should see a psychiatrist..
1 It is irrelevant because it merely deals with the change in redshift, and never considers the CAUSE of redshift. 2 Yes it does, it works with any model because it only provides the maths for the change in redshift. 3 I have read it several times and, unlike you, understood it. If redshift is an optical effect, than CMBR would be the black body radiation of all the ever more distant sources, shifted entirely off the visible spectrum and therefore the solution to Olber's paradox. which takes us back to the beginning of the argument, though, doesn't it? Which goes to Olber's paradox, that it would a combined infinity of sources, all from over that horizon line of being redshifted entirely off the visible spectrum. As it is, you haven't explained how there is both a stable vacuum, as defined by the speed of light and an expanding vacuum, as measured by the redshift of the same light. The theory still assumes standard lightyears to measure these expanded dimensions. Also both inflation and dark energy are now needed to keep BB cosmology working. I'm a skeptic. if it walks/talks/argues like a deliriousneuron/duck..
Wow! I've just realised that, using the same logic, Captain Stumpy is actually Uncle Ira! They both frequently use the word "the", they both post a load of crap, they both attack anybody who says anything they do not like, they both use copious sock puppets to upvote their own postings and downvote others! Its absolutely obvious! Cap, you are definitely a moron.